"This is a different twist on coleslaw that goes over really well. It is based on a recipe I found in a cookbook but I found it was much simpler to make this way and people seemed to like it better as well." Mix canola oil, red wine vinegar, soy sauce, and sugar in a large bowl, mixing until sugar has dissolved. 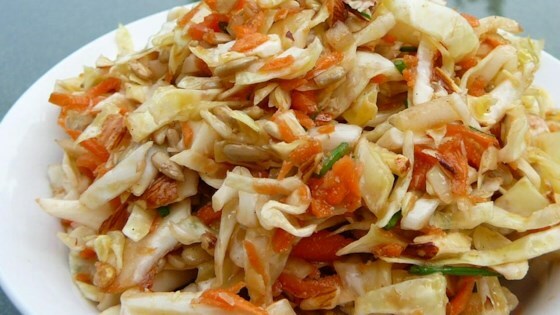 Toss cabbage, green onions, almonds, and sunflower seed kernels into the dressing. Cover bowl and refrigerate at least 1 hour before serving; slaw tastes better when chilled overnight. Best mayo free coleslaw I have ever made! You won't miss the mayonaise; the flavor is delicious. This was a big hit with my family! I will make it again. This recipe is going to be my go recipe for pot lucks!